Traveling around the country can be one of the most exciting times you’ve ever had, but it can also be extremely costly. Finding adventures in just about any state you visit can lead to some wonderful memories, and it can be a great bonding experience for you and a loved one, but few of us want to drop thousands of dollars on a single event. That’s why it’s important to look for ways you can have fun on a budget, and fortunately, there are many of them available. For those who want to travel to New York City, the experiences are too numerous to mention. Sightseeing. shopping, checking out historical landmarks, and visiting famous sites are all great ways to spend time while you’re there, but if you’re looking for something a bit more adventurous, try finding a great hiking trail, or rent a kayak so you can admire the city skyline from the water. The great thing about these activities is that you can fit in a workout at the same time, meaning you’ll feel better and won’t have to worry about finding a gym. Keep reading for some great tips on how to find budget-friendly adventures in NYC. 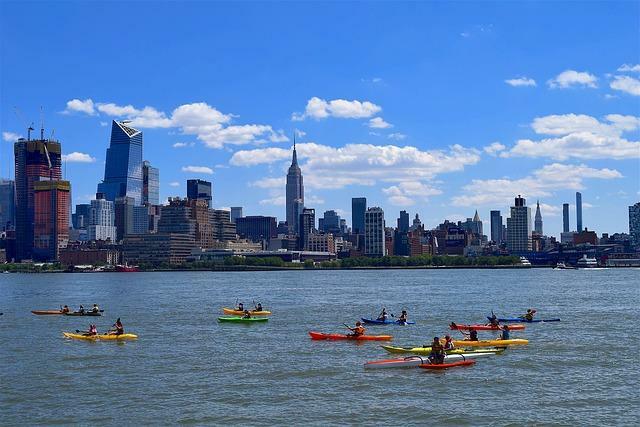 The New York City Downtown Boathouse offers kayak rentals on the Hudson River, meaning you can spend time on the Hudson while enjoying the view of the city skyline. The best part: It’s free, plus they provide changing rooms, safety equipment, and sunscreen. Just make sure you go during their open season, from May to October, and leave your animals at home. The Brooklyn Botanic Garden is a beautiful place to get out into nature, walk around, and enjoy everything from orchids to a Japanese-style garden, and on Friday mornings, entry is free. If you get through all the garden space and still want to stretch your legs, head over to Lakeside at Prospect Park for roller or ice skating, then stop at the cafe for a bite to eat. There are tons of great campsites in New York State, but did you know you can pitch your tent as close to NYC as Staten Island? Fort Wadsworth in Gateway National Recreation Area is a wonderful place to set up camp, with beaches for swimming and fishing, views of the Statue of Liberty, and playgrounds for the kiddos. Read on here for more info, and make sure you have all the best camping gear before you make any plans. One doesn’t usually think of New York City when hiking comes to mind, but there are actually quite a few gorgeous trails that are close by — one of which runs right through the Bronx’s Pelham Bay Park. Many of the trails are loops, meaning you can potentially get through them and back to NYC in time for dinner, but some are a bit more involved. All hiking expeditions require the right equipment and boots, and you’ll also need to prepare for mosquitoes and other wildlife. Do a little research on each trail before making a decision; you don’t want to end up taking one that’s too advanced for your skillset. Having fun in NYC isn’t hard, but when you’re looking for ways to stretch your dollar, it can be a bit more difficult than in other cities. Do some homework beforehand to make sure you have a good plan, and come prepared so you won’t have to drop money on new clothes, boots, or gear at a pricey shop. With a solid plan, you can have a blast without spending a ton of money. What are your favorite free NYC adventures? Let us know in the comments!